Children born by caesarean, or C-section, more often develop food allergies. The opposite applies to very preterm children. This is shown in a study of more than one million children conducted by researchers at Örebro University and Karolinska institutet, published today in the Journal of Allergy and Clinical Immunology. 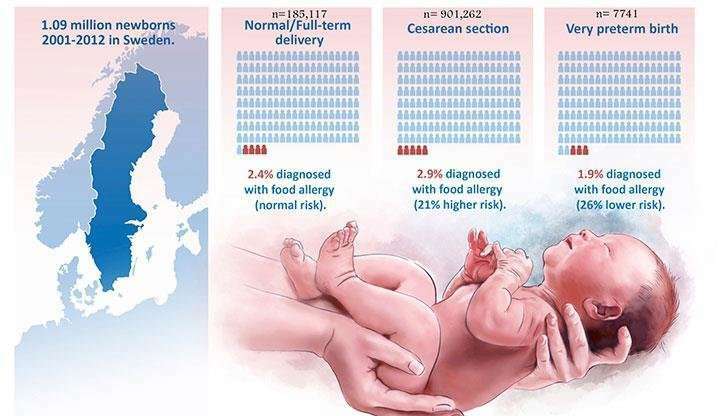 "We believe that children born by C-section have a different bacterial flora than that passed on to vaginally delivered children and that the flora may impact the risk of developing food allergies," says Jonas F. Ludvigsson, paediatrician and researcher at Örebro University. "We do not know for sure why the risk is lower in very preterm children, but it may have to do with the neonatal care that they receive," says Niki Mitselou, paediatrician as well as doctoral student at Örebro University and the lead author of the study. Niki Mitselou and Jonas Ludvigsson have studied children born between 2001 and 2012 in Sweden. Data shows that children born by C-section run a 21 percent higher risk of developing food allergies than children born by normal delivery. Smaller studies with similar findings have been conducted, but this is the first major national study where researchers have been able to point to a link between childbirth method and food allergies. "One in six children today is born by C-section. It is important that the mothers-to-be and physicians are aware of the risks associated with C-sections both in the short and long term, and that these risks are taken into account in planned C-sections," says Niki Mitselou. "Then there are of course acute situations when an emergency C-section is absolutely necessary, whether the child in the future will develop food allergies or not." What surprised the physicians the most was that children born preterm run a lower risk of developing food allergies – a 26 percent lower risk in fact. "We have studied the very preterm children – born before week 32. Since these children are closely monitored by paediatricians also after they have left the neonatal ward, any food allergies should most likely have been detected. Instead, these children are at a lower risk." "We believe the lower risk may be because of a different food introduction to very preterm infants compared to other children, or that factors relating to neonatal care may protect against food allergies," says Jonas F. Ludvigsson. The researchers have also studied the impact of birth weight and the newborn's status five minutes after birth (the so called Apgar score). During this test, physicians evaluate on a scale of 0 to 2, for example the baby's breathing, pulse, colour and activity. "Children who scored low directly after birth, a sign of severe stress during birth, run an increased risk of developing food allergies. This also applies to children who have a higher birth weight than expected," says Niki Mitselou.